It offers consumers a personal involvement in the creation of their ice cream. It extends the theatre and wonder that normally goes with the making of a freshly made cone across a number of new menu choices, each one with its own unique speciality. It adds fun, creativity, luxury and indulgence to the much loved ’99’ and turns your store into a destination zone for the local community. Ice cream solutions, it’s all we do... ...and we do it all! 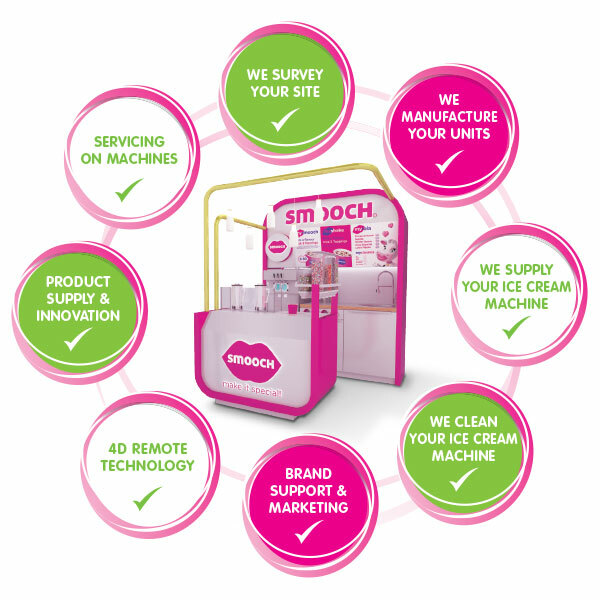 Here at Smooch we provide the full solution to your ice cream parlour. We do not believe in fitting your parlour out and then walking away. Our dedicated Smooch team are devoted to ensuring your staff are fully trained with on going audits to provide the best brand standards at all times. With full marketing support prior to opening your store and our national marketing strategy we make sure that we are leading the market with the latest concepts and innovation ensuring you always have something new and exciting to offer! Included in your fitout package is a customised launch day to let your customers know about your new Smooch parlour. It’s all in the tasting!! We keep those social media monsters up to date with our Smooch brand competitions, new product launches and latest ice cream gossip!! Q. Will I require extra staff? A. No! We position your Smooch ice cream parlour near the tills so that your existing staff can operate it. Q. Will I get support and back up after Smooch is installed? A. We ensure that your staff are fully trained. We provide full back up and technical support services. Q. My shop is already full with existing equipment. How on earth can I fit Smooch in? A. We have an expert team of designers, engineers and shopfitters who will work this out. Every Smooch installation is bespoke. We will make sure that your new Smooch parlour fits and compliments your existing store layout. You buy and own the fit out and we support you with staff training, product supplies and marketing. The only conditions we have is that you buy your stock from us so we can protect the customer engagement and consistency of brand. We are a family run business operating since 1991, small enough to care and big enough to support and are Ireland’s leading supplier to the soft serve ice cream market. Smooch is the No. 1 brand ice cream parlour solution in Ireland and at the heart of the brand is our high quality real dairy ice cream and exceptional customer focus.